Shahira, a young, divorced mother of a seven-year-old son, wants nothing to do with a man, ever again. But circumstances have forced her hand, and Hussain’s unusual proposition leaves her secretly relieved. As per their contract, she’ll have his name, will be paid to look after his ailing mother and motherless daughter and will be left well alone by him. Perfect! Hussain is suave and rich. He is nobody’s fool…and is not about to be bested by the ex-schoolteacher he is married to. He has Shahira in his sights and she has to have all her wits about her in order to hold him at arm’s length. Will she ever be ready for the kind of marriage he wants? Zeenat Mahal is an avid reader and has been writing for as long as she can remember. She has an MPhil in English literature from Government College Lahore and is currently doing an MFA in creative writing from Kingston University, London. 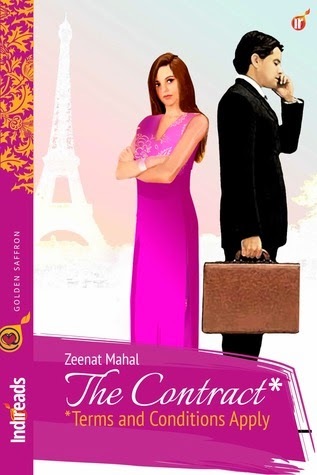 She won a BBC short story competition in 2001 and has been a regular contributor to newspapers.Running out of Ink, another international online magazine has published her short story, The Accidental Fiancee in their August 2013 issue.‘Haveli’ and 'The Contract' are Zeenat’s first two published novellas. Currently she is working on a novel. This is the second book I am reading by the author and yes my expectations were a bit high having loved her previous work Haveli.A tall brooding hero and a strong independent heroine, well that now is an interesting mix that would attract any reader to the story making him drown in those pages and that is what happened with me too. I enjoyed reading the gripping story line that the author had penned for this book and for the happy endings lover in me, this book was like a gift from heaven. It was cute, sweet, spicy, and tangy and tongue tantalizing all in perfect doses making it a nice, engrossing read. Recommended for people who love reading such light entertaining reads! This book is like raspberry cheesecake - sweet and goey!